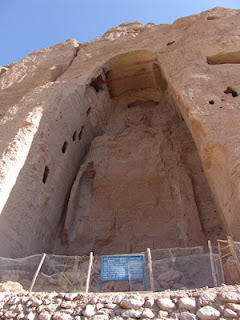  Home  Afghanistan  Anthropology  Archaeology  Rebuilding the Bamiyan Buddhas? One of the most important historical sites on the ancient Silk Road between China and the West is Bamiyan in Afghanistan. 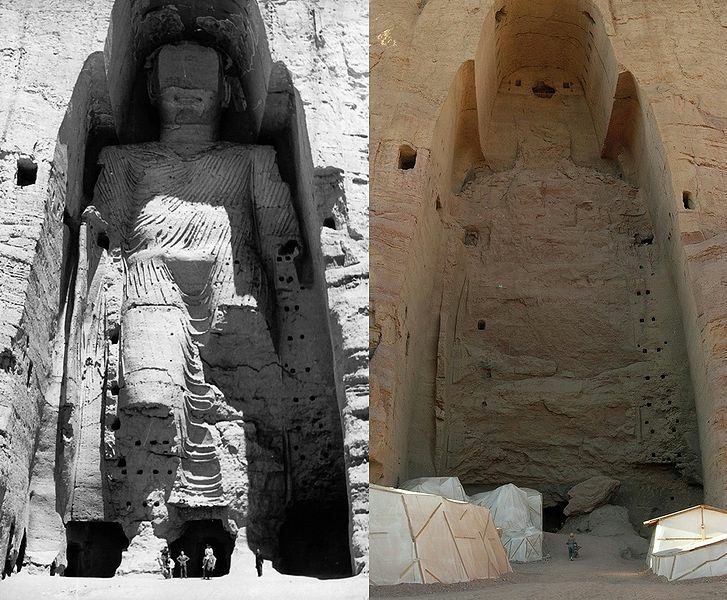 An article published on the BBC News website this week discusses the issues surrounding calls to rebuild the famous colossal Buddhas which were destroyed by the Taliban in March 2001, versus calls to leave the giant niches standing empty. The Statues which date to the 6th century were carved directly into the sandstone cliff-face, and the surrounding hillside is riddled with man-made caves. The site was once a great Buddhist sanctuary with Buddhist monks occupying the caves, many of which were decorated with Buddhist frescoes that are now thought to represent the earliest use of oil painting in art. The two giant statues of standing Buddhas were modelled largely in the Gandharan-style – in which Hellenistic forms merged with Buddhist themes, strongly characterised by sensuous lines which made for a distinctive aesthetic of idealistic-realism – most notably marked by the stylised flowing forms of drapery laid over serenely beautiful representations of the human figure. The Statues were carved into the cliff with surface details embellished in moulded stucco and adorned with precious stones and metals. Bamiyan was visited in 630 AD by a Chinese Buddhist pilgrim, named Xuanzang (c.596-664), who wrote the classic Chinese text Great Tang Records of the Western Regions – which in turn is said to have inspired the better known classic, Journey to the West, perhaps more popularly known as Monkey (attributed to Wu Cheng’en). Xuanzang described Bamiyan at the time of his visit, noting that there were ten monasteries situated there with over a thousand monks in residence. Curiously, he also describes a third statue of a reclining Buddha which has since been lost – and some think still exists and lies waiting, yet to be discovered. The two standing Buddhas were destroyed in March 2001, using a combination of dynamite, artillery shelling and anti-tank mines, under the orders of the ruling Taliban regime, who are said to have decreed that the Statues were symbols of idolatry and therefore were contrary to the principles of an extremely strict interpretation of Islamic Sharia Law. Even though the Buddhist community who created the monuments have long since left the site and the local community is now in the present era an all Muslim population, international calls to preserve the monuments as cultural assets of world historical importance were ignored by the Taliban leaders who went ahead with their destruction. It seems that before this occurred several governments and international bodies made various offers to try to induce the Taliban to hold fire, some of which possibly only further raised or inflamed contentious issues concerning the provision of aid to the local communities of the Bamiyan area; issues which have since muddied the perception as to exactly why the Taliban proceeded with such a drastic and regrettable destruction. Many countries around the world, including the few foreign Governments who supported the Taliban regime, roundly condemned their actions. Yet the legacy of this destructive act remains an indefinitely contentious and complex one. There are increasing calls to attempt to restore one, if not both, of the Statues; other proposals have suggested recreating the figures using laser projections; yet some insist that the niches should remain empty as monuments in themselves. The arguments for each case are complex even within the camps of their own supporters. 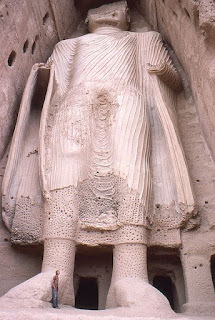 Some argue that they should be recreated in defiance of the Taliban’s arbitrary decree; while the motivation for some in proposing they should be rebuilt is perhaps religious or purely in the interests of historical preservation, seeking to uphold notions of a ‘world heritage’; others say the niches should remain empty as a monument to the intolerant and ignorant exclusivist ethos which decreed their destruction. But by the very nature of such an international debate, opinions will naturally vary widely, and not everyone will see eye to eye. Too many different agendas are at play. Some argue that the essentials are what matters most. The Statues were remnants of a superseded faith which no longer populated the area, and so to rebuild them would be contrary to the belief system of the present local populace. Even though that populace had (we assume) largely been happy to live in the shadow of these colossal monuments for centuries without problem or offence. Yet to ask them to support or even participate in their restoration or rebuilding would run contrary to all the tenets of their system of religious beliefs. And yet, to allow outsiders to come in and undertake the work would smack of the imposition of old world imperialistic projections into an area suffering from the day-to-day realities of poverty, deprivation and lawlessness, when such an area could clearly benefit from international interventions of a drastically different ethos and orientation. Why put the Buddhas back on their feet and yet not assist the local people to get back on their feet? – Naturally some would argue that such a project would indeed be just such an investment, bringing jobs, wealth, and a sustainable source of income in the form of future foreign tourism. Each argument can be cancelled by another and vice-versa; and so the wheel of misunderstanding continues to revolve, stuck in the cycle of its own intellectual death and rebirth. Admittedly, with the coming of Genghis Khan (c.1162-1227) in 1221, the site was abandoned by its Buddhist founders who were ruthlessly driven from the valley in revenge for the death of the Khan’s grandson who had been sent with a military force to seize Bamiyan. The irony here is not lost though – in the simple fact that one of the original tenets of the Buddhist faith itself is that all things are subject to change, the sutras state that nothing remains forever; consequently, one has to consider whether rebuilding the Buddhas is not so much contrary, as possibly even acceptable to the Buddhist faith? Whether or not this debate or these issues will be resolved or instead a resolution imposed without the full consent, agreement, or satisfaction of all the parties concerned, one thing is clear. In their destruction more has been learnt about the Buddhas. A small wooden reliquary cache was recovered from the chest of one of the Buddhas which has enabled the date of its creation, or rather its consecration, to be accurately established. There has been very little proper archaeological investigation of this vast ancient site, which apparently remains seeded with landmines. It is clear though that there is much more to be discovered at this crossroads of antiquity, a place where a turbulent past meets an equally turbulent present. UPDATE: (February 21st 2015) UNESCO Reveals Winning Scheme for the Bamiyan Cultural Centre - One of the judging panel is my colleague, Bob Knox. More info on the international competition here.